These cupcakes were made during the same cupcake-a-thon as the previous turtle cupcake. Unfortunately, the kids really thought it was a hoot! They all wanted one. 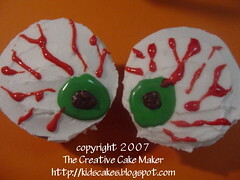 I have three kids...and as you can see, only 2 eyeball cupcakes. More had to be made...soon. Where can I get ideas for my cakes?